It's the end of our time with the Volkswagen e-Golf. 13 November 2018: Why is Tesla the daddy of electric cars? If only the Volkswagen e-Golf could be charged using Tesla's Supercharger network. 30 October 2018: A silent killer? Can pedestrians hear the e-Golf? Should electric cars make an artificial noise? Andy investigates. 16 October 2018: Where are all the Volkswagen e-Golfs? Andrew hasn't seen another e-Golf on the roads. Is ours a one-off? 2 October 2018: How can you maximise the range of an electric car? 18 September 2018: How good is the charging infrastructure? We love the Volkswagen e-Golf but the infrastructure isn't quite there yet. How easy is it to find a replacement windscreen for the Volkswagen e-Golf? Andrew was all too keen to find out. 21 August 2018: How far does the e-Golf go on a single charge? The e-Golf undertakes its longer single-charge drive. How far can it go? Andrew finds out. 7 August 2018: What options should you choose? So which option boxes should you tick when speccing an e-Golf? Andy has a look at what he'd spend all his imaginary money on. 24 July 2018: What options shouldn't you choose? If you want to buy a Volkswagen e-Golf like mine, it will cost you a whopping £37,040. Or will it..? 26 June 2018: How does the Volkswagen e-Golf compare to the Nissan Leaf? A convenient test of the new Nissan Leaf represented to perfect opportunity for us to compare it with our Volkswagen e-Golf. 12 June 2018: Can the Volkswagen e-Golf cover longer journeys? 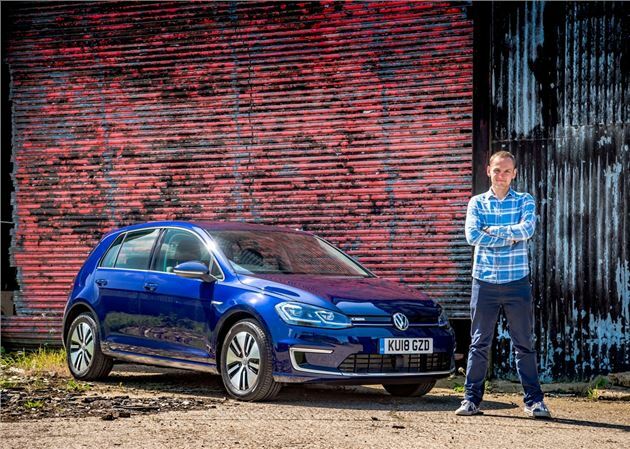 Andrew attempts a longer journey in the electric Volkswagen e-Golf. It all goes surprisingly swimmingly. Just how usable is an electric car every day? Andy's getting to grips with the UK's EV charging infrastructure.